Saint Michael (Mikhail) of Chernigov was the son of Vsevolod Svyatoslavich (who later became grand prince Vsevolod IV the Red of Kiev), by Anastasia, the daughter of grand duke Casimir II of Poland. The patrimonial domain of his father was located in the northwestern part of the Vyatichi lands where he undoubtedly spent his childhood. He was noted from childhood for his piety and mildness. His health was very poor, so his grandfather, grand prince Svyatoslav III Vsevolodovich of Kiev gave much wealth to churches in unsuccessful attempts to obtain a cure. 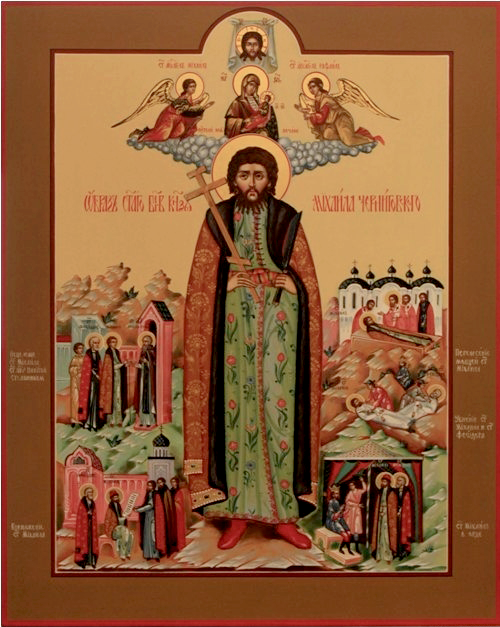 Finally in 1186, he heard of the wonderworking grace of Saint Nikita the Stylite of Pereyaslavl (May 24), so the prince, accompanied by boyars, rode to the town and arrived at the monk's pillar. 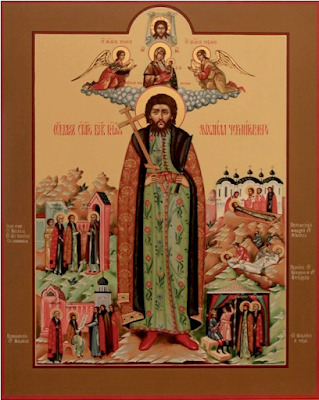 The stylite gave his staff to one of his boyars to take to the prince; Michael took hold of it, was cured, and walked to the wonderworker's pillar for his blessing. Following his cure, he gave a generous benefaction to the monastery and ordered a stone cross to be erected, according to one source on 16 May 1186, on the spot where he was cured. 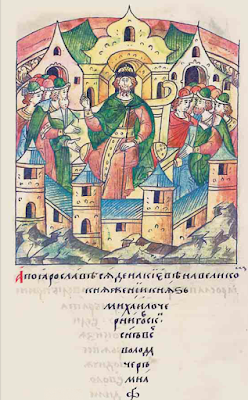 No sources report Mikhail's marriage, but evidence suggests that he married Elena Romanovna (or Maria Romanovna), a daughter of prince Roman Mstislavich of Halych in 1210 or 1211. 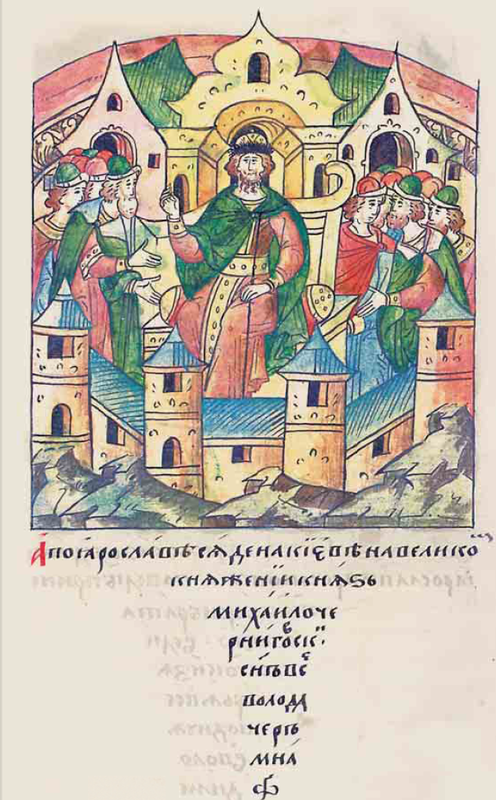 In 1223 Prince Michael took part in a council of Russian princes at Kiev, debating whether to aid the Polovetsians against the approaching Mongol-Tatar hordes. With the death of his uncle, Mstislav of Chernigov in the Battle at the Kalka River in 1223, Michael became Prince of Chernigov. In 1225 he was invited to be prince of the Novgorod people. Through his sense of justice, compassion and firmness he gained the love and respect of Old Novgorod. This was particularly important for the Novgorodians, since the accession of Michael as prince signified a reconciliation of Novgorod with the city of Vladimir’s holy Great Prince George Vsevolodovich (March 4), whose wife was the holy princess Agatha, sister of Prince Michael. But Michael did not long remain prince at Novgorod. He soon returned to his native Chernigov. To the stipulations and requests of the Novgorodians to remain prince he answered that Chernigov and Novgorod ought to become kindred lands, and their inhabitants like brothers, and he would forge the bonds of friendship of these cities. The noble prince assiduously concerned himself with the building up of his appenage realm. But it was difficult for him in these troubled times. His activity provoked unease in the Kursk Prince Oleg, and in 1227 internecine strife nearly erupted, but Metropolitan Cyril of Kiev reconciled them. And in this same year Prince Michael peacefully resolved a dispute between the Kiev Great Prince Vladimir Rurikovich and the Galich prince. In 1235 Prince Michael occupied the throne of Kiev. Troublesome times ensued. In 1238 the Tatars (Mongols) laid waste to Ryazan, Suzdal, and Vladimir. In 1239 they moved against South Russia, and ravaged the left bank of the Dniepr River, and the lands of Chernigov and Pereyaslavl. By the autumn of 1240 the Mongols were coming close to Kiev. The khan’s emissaries proposed that Kiev surrender voluntarily, but the prince would not negotiate with them. Prince Michael rode urgently to Hungary, to persuade the Hungarian king Bela to organize allied forces to resist the common enemy. Michael tried to recruit both Poland and the German emperor into the struggle against the Mongols, but the moment for a combined resistance was lost. Rus was devastated, and later Hungary and Poland. With no foreign support, Prince Michael returned to the ruins of Kiev and for a certain time he lived near the city on an island, and then he resettled in Chernigov. The prince did not abandon hope in the possibility of an united Christian Europe against the Asiatic nomads. In 1245, at the Council of Lyons in France, his co-worker Metropolitan Peter (Akerovich) was sent as emissary by Michael, calling for a crusade to march against the pagan Horde. Catholic Europe in the persons of its chief spiritual leaders, the Roman Pope and the German emperor, betrayed the interests of Christianity. The Pope was involved in a war with the German emperor, and the Germans took advantage of the Mongol invasion to attack Rus themselves. These circumstances affected Christianity in general, and there is a universal significance that led to the martyrdom of the Orthodox Prince Saint Michael of Chernigov in the midst of the pagan Horde. In Rus emissaries of the khan soon appeared, in order to conduct a census of the Russian population and to impose taxes upon it. The prince was ordered to make full submission to the Tatar khan, and for his princely realm, the khan would grant a special charter. The emissaries informed Prince Michael that it was necessary for him to journey to the Horde for an affirmation of rights to rule the princedom under the khan’s charter. Seeing the woeful plight of Rus, Prince Michael recognized the need to obey the khan, but as a fervent Christian he knew that he would not deny his faith before the pagans. From his spiritual father, Bishop John, he received a blessing to journey to the Horde and be a true confessor of the faith of Christ. With the holy Prince Michael on the journey to the Horde went his faithful friend and companion, the noble Theodore (Feodor). At the Horde they knew about Prince Michael’s attempts to organize an uprising against the Tatars in concert with Hungary and the other European powers. His enemies had long sought the opportunity to destroy him. They reported to the khan about the firmness of the Russian Prince. Batu’s attendant El’deg delivered the conditions: either fulfill the demands of the pagan priests, or die in torments. But this also was followed by the resolute answer of holy Prince Michael, “I am prepared to submit to the emperor, since God has entrusted him with the destiny of the earthly kingdoms, but as a Christian, I cannot worship idols.” The fate of the brave Christians was sealed. Taking courage in the words of the Lord: “Whoever would save his life, shall lose it, and whoever will lose his life for My sake shall save it” (Mt. 16:25), the holy prince and his devoted boyar prepared for a martyr’s death and received the Holy Mysteries, which their spiritual father gave them, foreseeing this possibility. The Tatar executioners seized the prince and for a long time they beat him fiercely, until the ground ran crimson with blood. Meanwhile the prince comforted Theodore who stood nearby him by saying: "Be strong because your punishment will not last long and then at once eternal joy will follow." Finally, Doman of Putivls, an apostate from the faith in Christ, trampled on his chest with his boots until the prince died then cut off the head of the holy martyr with a knife on September 20, 1246. 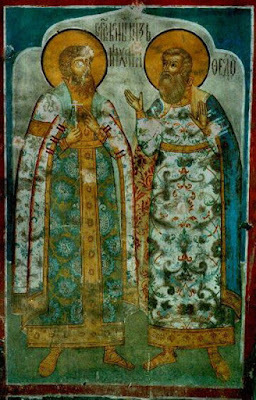 The Tatars deceitfully promised Saint Theodore great honor and his lord’s princely rank if he would fulfill the pagan ritual. But Saint Theodore was not swayed by this, and he followed in the path of his prince. After quite vicious torments they beheaded him. The bodies of the holy passion-bearers were thrown to be eaten by dogs, but the Lord miraculously guarded them for several days, until faithful Christians could secretly bury them with reverence. 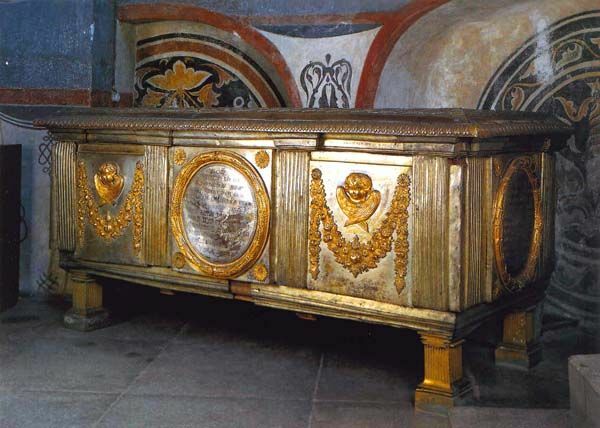 Later on, the relics of the holy martyrs were transferred to Chernigov. 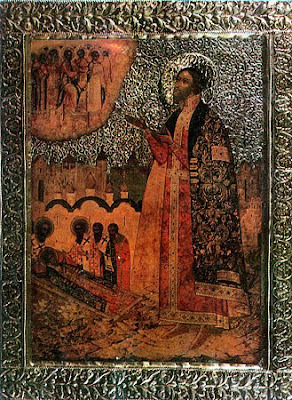 The martyrdom of Saint Theodore amazed even his executioners. Persuaded of the Russian people’s steadfast fidelity to the Orthodox faith , and their readiness to die for Christ with joy, the Tatar khans decided not to try the patience of God as before, and ceased demanding that Russians at the Horde perform any pagan rituals. But the struggle of the Russian nation and the Russian Church against the Mongol Yoke continued for yet a long time. The Orthodox Church was adorned in this struggle by new martyrs and confessors. Great Prince Theodore was poisoned by the Mongols. Also martyred were Saint Roman of Ryazan (+ 1270), Saint Michael of Tver (+ 1318), his sons Demetrius (+ 1325) and Alexander (+ 1339). All of these took courage from the example and holy prayers of the Russian Protomartyr of the Horde, Saint Michael of Chernigov. His wife survived him and promoted his veneration. His daughter Maria and her sons, Boris and Gleb Vasilkovich, inaugurated the Feast of the Wonderworkers of Chernigov, on September 20, and built a church in their honor. Her sister, Feodula who had become the nun Euphrosyne also advanced his veneration to judge from a 17th-century account which reports the existence of a wooden chapel in Suzdal dedicated to them. The veneration was approved in 1547. 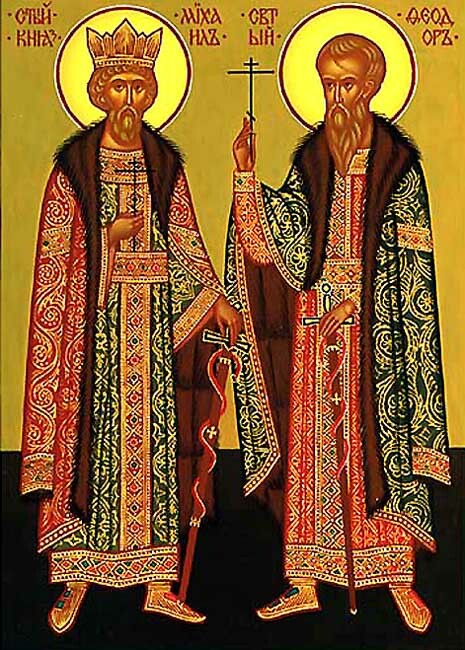 On February 14, 1572, at the wish of Tsar Ivan Vasilievich the Terrible, and with the blessing of Metropolitan Anthony, the relics of the holy martyrs were transferred to Moscow, to the temple dedicated to them. From there in 1770 they were transferred to the Visitation Cathedral, and on November 21, 1774 to the Archangel Cathedral of the Moscow Kremlin. The Lives and Service to Saints Michael and Theodore were compiled in the mid-sixteenth century by the renowned church writer, Saint Zenobios of Otonsk. “The generation of the upright shall be blessed,” says the holy Psalmist David (Ps. 111/112:2). This occurred in full measure for Saint Michael. He is at the head of many famous families in Russian history. His children and grandchildren continued the holy Christian service of Saint Michael. The Church also numbers his daughter Saint Euphrosyne of Suzdal (September 25), and his grandson Saint Oleg of Briansk (September 20) among the saints.